Motorola is planning to roll out Android 4.4 KitKat firmware to their flagship Moto X all variants as well as some latest Droid variants. They are now letting the end users to know, which one is ready for the KitKat treat and which are excluded. Google released the latest Android 4.4 mobile operating system hours ago with their LG made Nexus 5 smartphone and Motorola suggests that all variants of Moto X are eligible for this update. As per the Google’s statement on Android KitKat – it said that the new mobile OS can run on the device with at least 512MB of RAM with closing of some background services and trimming memory usages. Although some old models including Motorola Atrix 2, Droid Bionic, Razr Mazz and Droid 4 can get the KitKat only via the custom ROMs by the way of rooting the smartphone. Beware – just wait for the stable version of the KitKat based OS. The company is not revealing the exact rollout/release date and promised to provide more details in the website soon. Moto X (XT 1058) is the only model getting the KitKat, whereas Atrix HD (MB 886) will remain on Jelly Bean 4.1.2 and Atrix 2 (MB 865) will remain on ICS. Atrix 4G (MB 860) and XPRT (MB 612) will remain on Gingerbread. Boost Mobile’s lonely handset Motorola XPRT (MB 612) will remain on Gingerbread. None of C-Spire devices will get Android KitKat as both Motorola Photon Q 4G (MB 897)and Milestone X2 (MB 867) will be having 4.1.2 Jelly Bean and Gingerbread respectively. NTELOS’ Motorola Razr Maxx (XT 910) will remain on ICS, whereas Milestone 3 (MB 861) as well as Milestone X2 (MB867) will remain on Gingerbread, hence none of the devices to get the KitKat update. The old Motorola Titanium (i1x) remains on Gingerbread. From the vast range of Motorola devices, only Moto X XT 1049 & XT 1056 are getting the KitKat treat, whereas Motorola Photon Q 4G LTE (XT 897) and Motorola Xoom WiFi (MZ 604) tablets will remain on 4.1.2 Jelly Bean and rest of the older devices wil remain on Gingerbread. Moto X (XT 1053) will be getting the Android 4.4 KitKat and the older Motorola CliQ 2 (MB 611) will remain on Gingerbread. Moto X (XT 1055) will be getting the KitKat update, whereas Motorola Electrify M (XT 901) and Electrify 2 (XT 881) will remain on 4.1.2 Jelly Bean. Motorola Electrify (MB 853) will be running on older Gingerbread version. Verizon has the largest number of Motorola devices, in which Moto X XT 1050 and XT 1060 along with Moto X Developer Edition (XT 1060) are getting the latest OS update. Additionally, Droid Ultra (XT 1080), Droid Maxx (XT 1080M) and Droid Mini (XT 1030) are getting the KitKat treat. However, company said “Future plan coming soon” on Droid Razr Maxx HD (XT 926), Droid Razr M (XT 906/XT 907), Droid Razr M Developer Edition (XT 906/XT 907), which are currently running on Android 4.1.2 Jelly Bean. The company also promise to release Android 4.1.2 Jelly Bean firmware update for Motorola Xyboard 8.2 (MZ 609) and Xyboard 10.1 (MZ 617) in Fourth Quarter of 2013. Lonely device, Motorola Triumph (WX 435) will remain on the out-dated 2.2 Froyo. 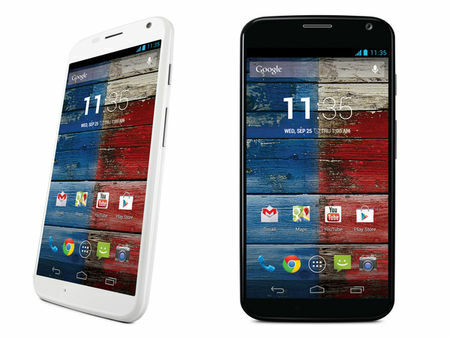 All Moto X models will be getting the Android KitKat update including the Developer Edition Moto X. Surprisingly, Motorola Droid Razr HD Developer Edition (XT 926) has the “Future plan coming soon” tag by the company.